Donorbox makes it easy for donors to contribute, so we’ve also made it easy for your organization to say thank you. Sending out year-end receipts is a great way to thank your donors and acknowledge how much their donations mean to your organization. This is also a great opportunity to set the stage for the coming year of gift giving. 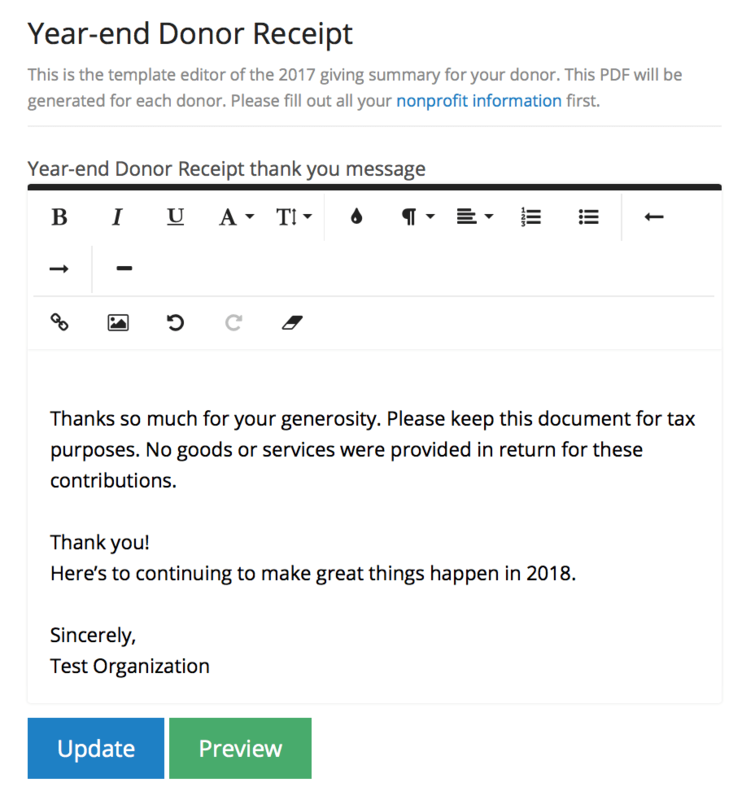 To help your organization be even more involved with its donors and help them with their taxes, we just rolled out a new feature that allows you to send year-end receipts with just a couple of clicks. 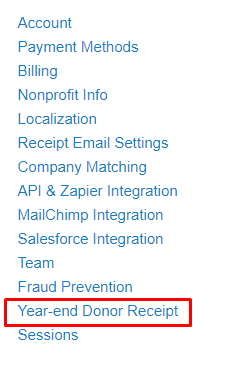 To editing the template of your year-end receipt, go to your Account, and click the option marked “Year-end Donor Receipt”. There you will find the option to edit your Fiscal Year Period, Year-end Donor Receipt and your Year-end Donor Email Template. To change the period of your fiscal year and make it easier for you to adhere to your region’s standard financial practices. Use the drop-down box, as shown, to select your preferred fiscal year period. Save it by clicking “Update Settings”. The year-end donor receipt is a summary of how much a specific donor has contributed to your organization. It includes your organization information and a summary of donations. Make sure to have all your organization information accurate and complete since this will be auto-generating a pdf receipt for each of your donors. You will be able to edit the final message of your receipt. 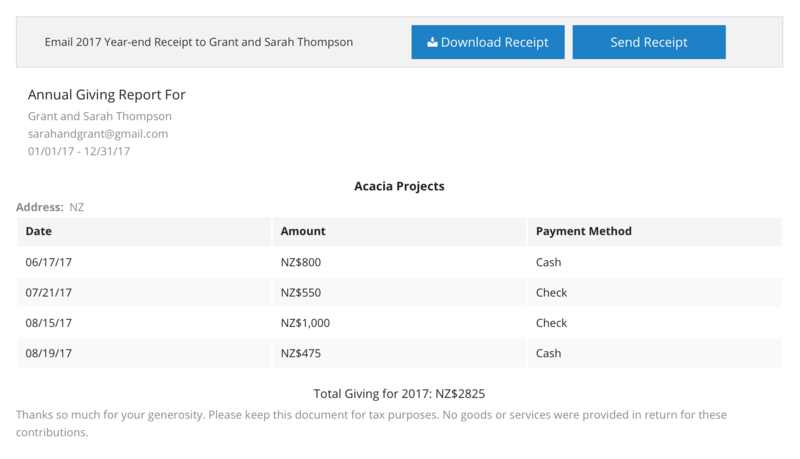 After editing the receipt, you will able to download a preview (with test data) of the receipt that your donors will get. The year-end donor email is the message that your donors will get in their inbox. Start by editing the subject line and body text of your email. Don’t forget your email will contain the receipt attached. After you have finished editing your email, you will be able to send a test email. Here you will have an opportunity to know exactly how your donors will be viewing their receipts. Once you are ready to start sending your year-end receipts, you will have several options. 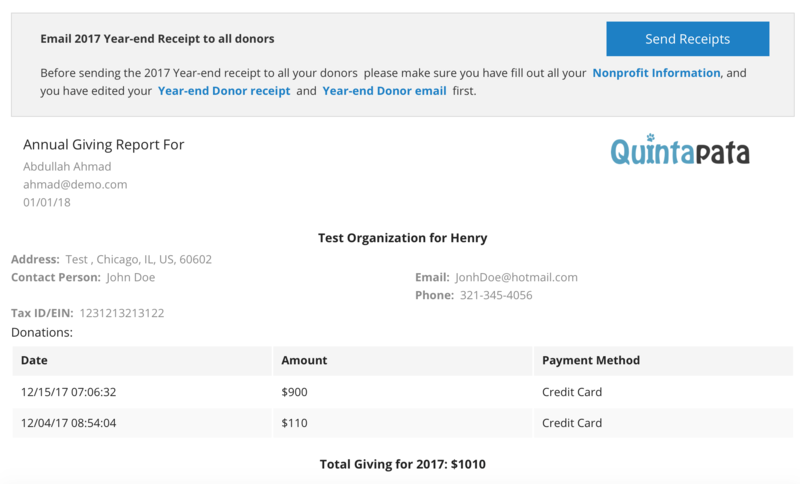 You can download each donors’ year-end receipt and send a hard copy, email the receipt to individual donors, or send a mass email to your entire donor base. Go to your Donors page, and next to the donors’ information you will find the option to select the ‘2017 Year-end Receipt’. If you click on a specific donor’s receipt, a modal window will pop up showing a preview of the receipt. To download a hard copy of the receipt for a specific donor, click on the ‘Download Receipt’ button located at the top of the pop-up window. To send an email to a specific donor with the receipt attached, you can click on ‘Send receipt.’ This will automatically send an email to the donor selected. You can also send your receipt to your entire donor base. To do this, go to your Donors page and find the ‘Send All Receipts’ button. When you click on it, a pop-up window will show a preview of the email. 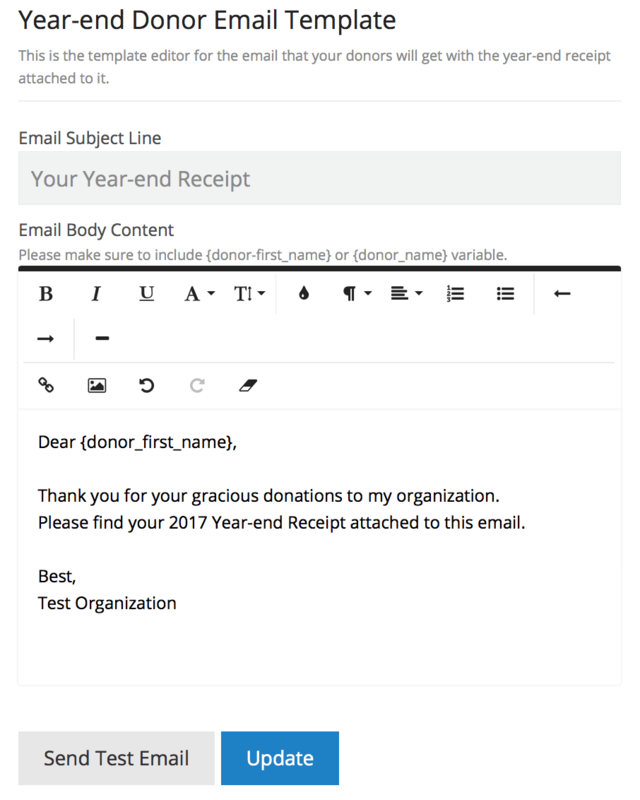 Click on ‘Send Receipts’ to mass email all your donors with the 2017 Year-end Receipt. It might take up to 15 minutes for all your donors to get the email. It is time to start sending those year-end receipts to all your donors!